No asparagus this week, but a small container of very juicy strawberries - yum!!! 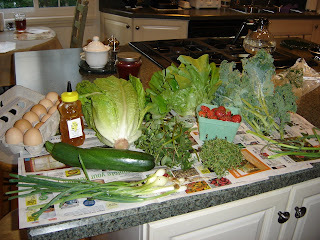 Also this week: eggs, honey, thyme, purslane, romaine, zucchini, garlic scapes, green onions, kale, and buttercrunch lettuce. I had never heard of purslane until this week's CSA newsletter. Wikipedia tells me that purslane contains more Omega-3 fatty acids than any other leafy vegetable plant. Traditionally, purslane was eaten as treatment for arthritis, inflammation and heart disease. Not sure how we'll use it yet, but we tasted some leaves last night and they were nice & mild. SP put a bunch of strawberries on his cereal this morning - I think he's tyring to snarf them all up the way I snarf up cheese...? !